Hoosier history overflows with bold visionaries, noble heroes and lovable rogues. May Wright Sewall struggled to uplift womankind and unflinchingly called for peace in a world sleepwalking toward conflict. In the guise of Abe Martin, Kin Hubbard graced the Indianapolis News's back page for twenty-six years with folksy humor. Combat photographer John A. Bushemi bravely faced the terrors of war and perished capturing its violence. Audacious automotive pioneer Carl G. Fisher went to any length to promote himself, even flying a car via a hot-air balloon. 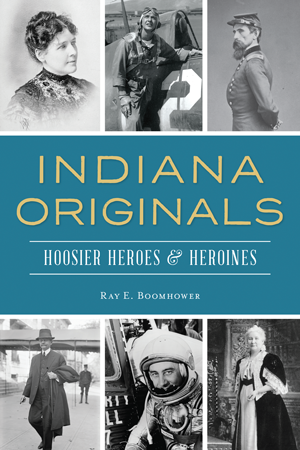 Drawing on more than thirty years of experience, author Ray E. Boomhower, the dean of Hoosier biographers, brings together forty of the most notable figures from the nineteenth state. Native Hoosier Ray E. Boomhower has worked at the Indiana Historical Society since 1987, serving as editor of the society’s popular history magazine, Traces of Indiana and Midwestern History, since 1999. He is the author of numerous articles and books on the nineteenth state, including biographies of such notable Hoosiers as Gus Grissom, Ernie Pyle, Lew Wallace and May Wright Sewall. In 1998, he received the Hoosier Historian Award from the IHS, and in 2010, he was named winner of the Regional Author Award in the Eugene and Marilyn Glick Indiana Authors Awards.